I took this shot on morning walk last weekend. I played around with textures. Please let me know what you feel about this. A fine painterly rendition of this beautiful early morning scene. Thumbs up for this creative effort! Like a gorgeous painting. Well done. Der Spaziergang hat sich glont, aber die Bearbeitung gibt dem Bild einfach den letzten Schlif, wirst ja zum PS Experten. A very pleasing, atmospheric result! This is a fantastic landscape with a beautiful mood!! I love the colors! A visually very pleasing photo to my senses. 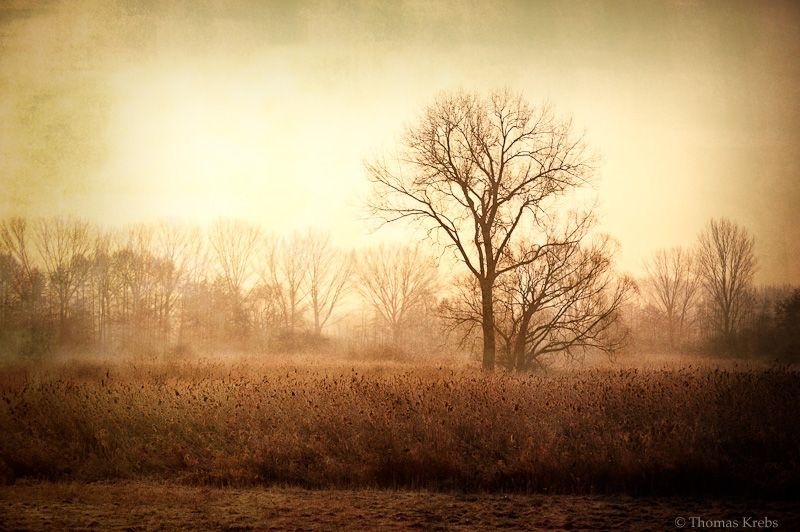 I like what you did with the textures; sharpening the foreground trees and the seed heads of the grasses compliments the softness of the misty background, very nice! I do like the vignette and warm hue as well. Great experiment! Really nice done. With the texture it looks more interesting! Absolut fantastische Bearbeitung. Gefällt mir sehr gut. Ja, die Bearbeitung und Dein photo sind spitzenmäßig, haben etwas von einem alten Gemälde.